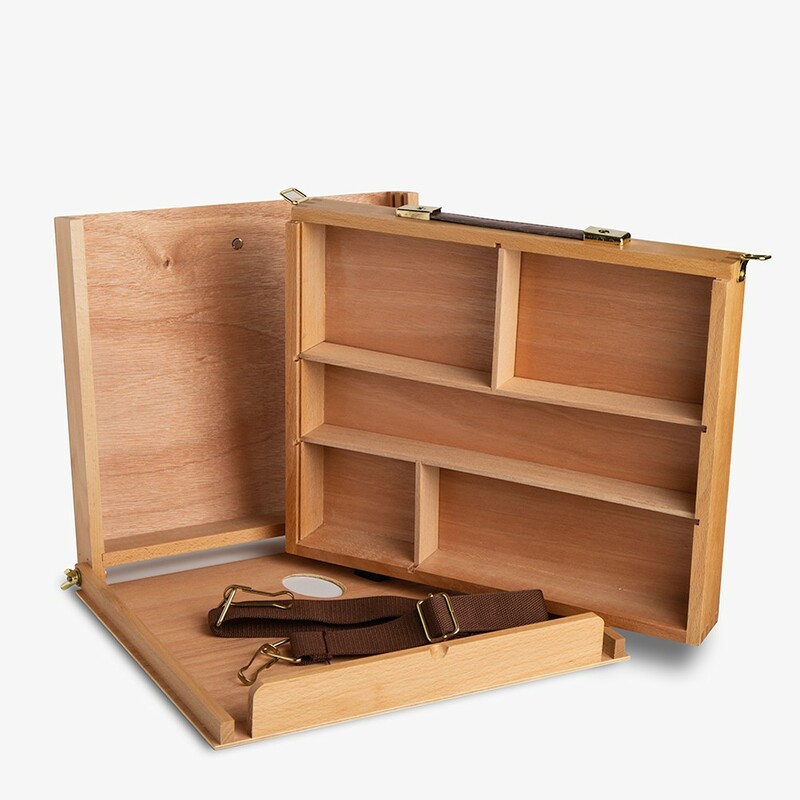 This pochade painting box is perfect for setting up a workplace in the home or painting plein air. 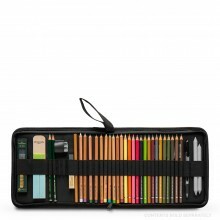 It’s lid folds out to provide an easel with handy slats for storing two wet boards after working. 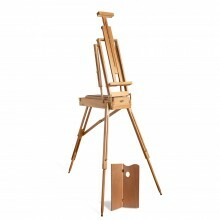 This easel can be secured at your desired angle using the inbuilt screws and butterfly turnings. The internal easel space has slots which are 6mm in width and an internal space of 30.6cm in width and a height of 27cm the depth is 4cm enabling you to balance a shallow small canvas within it. It has an internal palette attached to the easel lid both of which can be slid out and using the thumbhole as a support allows you to hold both palette and the easel top while standing, alternatively it can be placed on a surface or on your lap. This neat pochade box has a wood veneer and a top leather look handle that makes it comfortable to hold as well as a detachable shoulder strap to give you options. 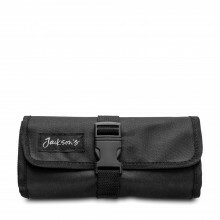 The outside of the box measures 31.5 cm x 28.3cm x 8.5cm and has the Jackson’s logo heat engraved onto it on the bottom right hand corner of the front. 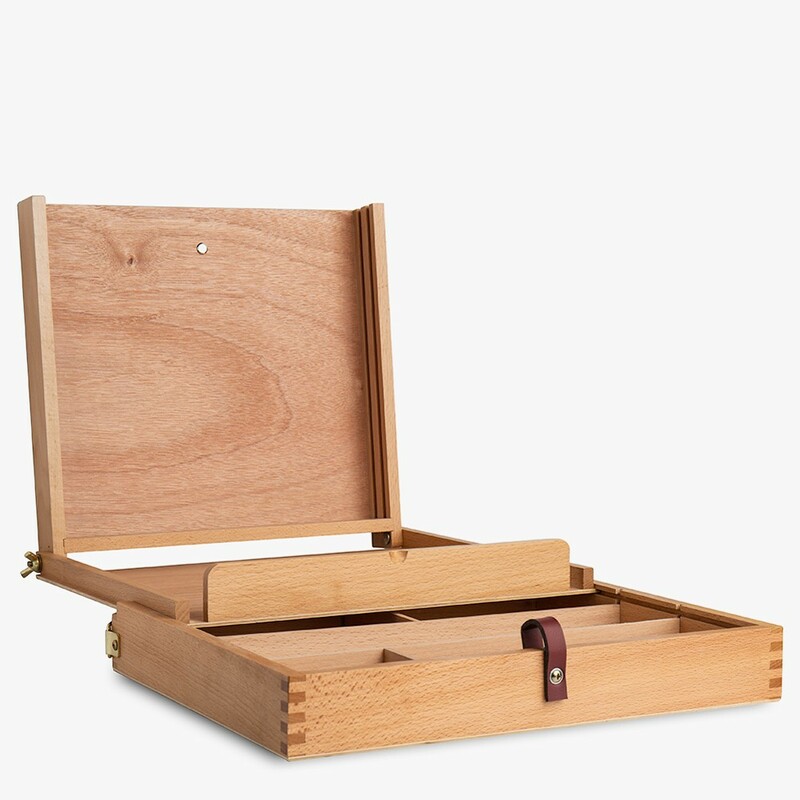 The inner inbuilt draw and main body of the pochade box has inbuilt sections, that can be removed, to store your paints, brushes mediums and rags. The depth of the draw is 3.6cm and there are two sections measuring 16.5cm x 11cm, one measuring 6.9cm x 33.7 and two more measuring 8.8cm x 10.5 cm and 8.8cm x 22.8cm retrospectively. A favourite among the artists at Jackson’s, you can also push the easel section out, away from you, to gain more perspective on a piece and use the draw, palette and easel simultaneously with ease. Q. Which part of the box is wood veneer and What is the rest of it made of (What wood). 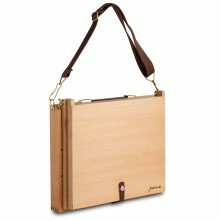 Also, What is the size of the boards which can be accommodated inside? A. 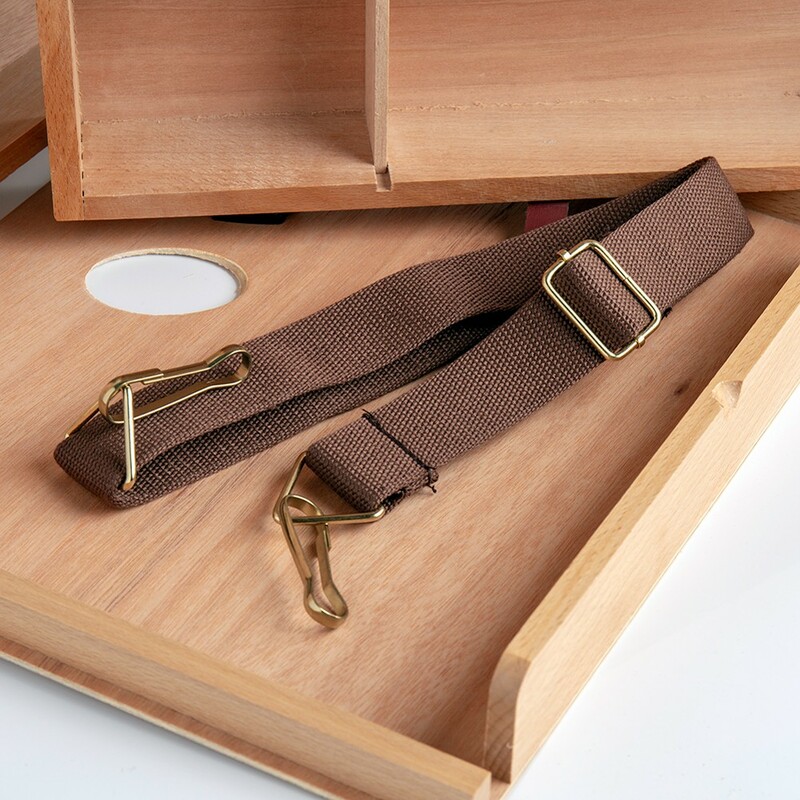 The Box is made out of Beech Wood and the interior of the box is Wood Veneer. It can hold a board of W: 30.6cm (12 in) x H: 27cm (11 in).